organissimo fourth CD captures the band in live performance, re-invigorating their original songs with new life and tight, funky interplay. A must-have! Alive & Kickin', the latest CD by organissimo, displays the soul-jazz trio at the top of their game in front of a live and lively audience. 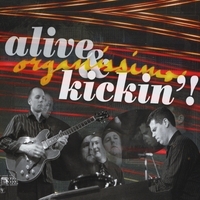 Recorded at WKAR-TV in Studio A as part of the television series BackStage Pass, Alive & Kickin' brilliantly showcases the tight ensemble interplay and seamless improvisations that are hallmarks of organissimo's sound. The track listing reads like a set of "greatest hits" from organissimo's repertoire of live favorites. Songs from all three studio albums are extended, revitalized, and re-interpreted in the moment, spurred to new places by the energy from the crowd. This is organissimo at their funky best! Alive & Kickin' bristles and roars with electricity and fire. The group's near telepathic reactions, honed from years of playing on the road together, are captured in beautiful high fidelity sound. Also featuring two bonus tracks recorded at Founders Brew Company; Frank Zappa's Blessed Relief and an incredible 18-minute long version of the crowd favorite Pumpkin Pie. A companion DVD, organissimo BackStage Pass, is also available featuring all the material from WKAR-TV plus two bonus cuts not on the CD.